As many independent designers and boutiques will attest, fashion is a fickle business in which success is often dictated less by hard work and creativity than by connections, timing and the eventual backing of a major conglomerate. This may explain why a brand such as Nom de Guerre—literally “war name” in French—could be both so short-lived and highly influential, particularly in relation to the current intersection of streetwear, sneaker culture, and high-end fashion. Founded in the early 2000s by the New York-based design collective Holly Harnsongkram, Wil Whitney, Devon Turnbull and Isa Saalabi, Nom de Guerre’s original incarnation was Isa. A bare-bones boutique at 88 N. 6th Street in Williamsburg, Brooklyn the store front carried Nike sneakers, Rogan denim and men’s and women’s clothing from brands such as Clarendon, United Bamboo, Maison Margiela, Blessed, and the first version of Brendon Babenzien’s Noah. 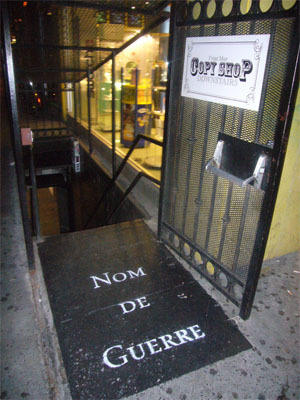 In October 2003, Harnsongkram, Whitney, Turnbull and Saalabi officially opened Nom de Guerre at 640 Broadway in a multi-level basement space (that was supposedly once a Black Panther hideout) beneath the Swatch store in NoHo. The new location was discreet, to say the least; customers entered down steps covered by a black, grate-like enclosure, with a “Copy Shop” sign painted at the top of the stairs. From what I can remember, a copy shop did, in fact, share the basement space in the store’s earliest years, but, eventually, the sign disappeared and “Nom de Guerre” typeface surfaced in its place. When it opened, Nom de Guerre wasn't necessarily the trailblazer we often make it out to be. A handful of similar downtown shops—such as New York/Tokyo-based Prohibit NYC—also offered a selection of imported Nike Dunks and Vandals, graphic T-shirts and straight-leg denim. In the early days of Nom de Guerre, you might have found a rack of screen-printed tees from the in-house label alongside European release Nike Dunks and Bapestas imported from Japan. But with the introduction of its first menswear collection for Fall/Winter 2005, Nom de Guerre grew into an entirely different animal. Offering military-inspired luxury staples that were mostly, if not entirely, produced in Japan, the brand developed its own unique niche that miraculously bridged the sensibilities of mid-2000s New York City sneaker culture with Japanese Americana and the aesthetics of up-and-coming young designer lines such as Robert Geller and Alexandre Plokhov’s Cloak. Sure, New York-based streetwear stores like Supreme, Stüssy, and Union had already built incredible hype and cult-followings well before 2005. None of those shops, however, offered Nom de Guerre’s unique mix of military aesthetics, minimalism and high-end production which elevated the clothing to designer heights without losing sight of its connection to youth and street culture. Their debut collection included a series of collaborations with Buzz Ricksons, Mackintosh, Converse, Russell Moccasin Company and Tricker's—an impressive brand list even by today's standard's. From strap-heavy paratrooper pants and down vests to Japanese selvedge denim and Melton wool M65 jackets, Nom de Guerre offered silhouettes and details that, much like the brands they stocked, are still relevant today. Boasting clothing from Wings + Horns (and the brand’s knitwear-focused precursor, Spruce), Comme de Garçons, A.P.C., Surface to Air and Band of Outsiders, as well as CdG accessories, Oliver Peoples sunglasses, shoes from Common Projects, Tricker’s and a coveted Nike Tier Zero account, Nom de Guerre laid the blueprint for many of today's most popular and successful menswear boutiques. The store paved the way for everyone from Boston's Bodega, to VooStore in Berlin and Notre in Chicago, all of which mix a range of high-end and streetwear designers with limited-edition offerings from Nike and Adidas. Nom de Guerre went a step further by establishing wholesale accounts for their in-house line with stockists around the world, including Oi Polloi in Manchester, Nomad in Toronto, Stels in Boston, Peasant in Michigan, Brigade in Cleveland, Jake in Chicago, Colette in Paris and Liberty in London. This same strategy—electic at home, with brand recognition abroad—has proved incredibly successful for current stores/brands such as Opening Ceremony and Très Bien. Strangely, Nom de Guerre, as well as the aforementioned shops, might never have existed in the same way if Nike hadn’t cracked down on the handful of New York City sneaker boutiques that both had Nike accounts and imported European and Japanese-only releases in the early 2000s, forcing shops to make the decision to stick with the Nike releases they were offered or go the consignment route that was already common in Japan, which eventually lead to shops like Flight Club and RIF Los Angeles. Later seasons saw Nom de Guerre move some of its production to China and reduce prices and it’s unclear if the challenge of balancing high-quality craftsmanship with customer-friendly pricing was partially responsible for the brand halting its in-house collection after the Fall/Winter 2010 season, with the store shuttering its doors shortly thereafter in early 2011. In fact, Nom de Guerre’s last days are a bit of a mystery and while this is purely conjecture, no doubt skyrocketing rents, unsustainable growth or the pressures of four people collaborating on a single vision all invariably played a factor. Despite Nom de Guerre closing shop, the brand’s website still exists as a living archive of the last few years of its existence, with the lookbooks from Fall/Winter 2008-Fall/Winter 2010 readily available. Unfortunately, it’s a challenge to find more than a handful of photos of the physical shop itself, since the brand’s heyday predated the explosion of fashion blogs and online shopping. Today, due to the sheer number of brands that defy the delineation between runway and street—OAMC and Public School, just to name a few—it’s easy to say the bridge between streetwear, sneaker culture and high-fashion was bound to happen. But fifteen years ago, when most sneakerheads still rocked oversized graphic T-shirts and cargo shorts, while the high-fashion set looked down at streetwear and urban-wear brands in general, the intersection wasn’t so obvious. While they lasted five years as a collection and seven years as a store, Nome de Guerre's impact is immeasurable in relation to today’s predominant menswear trends. Despite Nom de Guerre’s relevance to the current landscape of fashion, only one of its founders seems to have forged a successful career in the industry since. Wil Whitney ran the 21 Mercer Street Nike shop when it first opened and is now part of the team at Noah, which, as previously mentioned, Nom de Guerre once carried. Although a streetwear fan will occasionally pen an article pleading for Nom de Guerre to make a comeback, a resurrection of the brand seems highly unlikely. Instead, Nom de Guerre exists as a nostalgic remnant of a “simpler time” and a lesson on the pitfalls of the fashion industry. No matter how good the designs, how high-quality the production, how impressive the lookbooks, most small shops and brands are just a single poor-selling season away from closing. Some fashion may ascend to the heights of art, but it is and has always been, a business first.